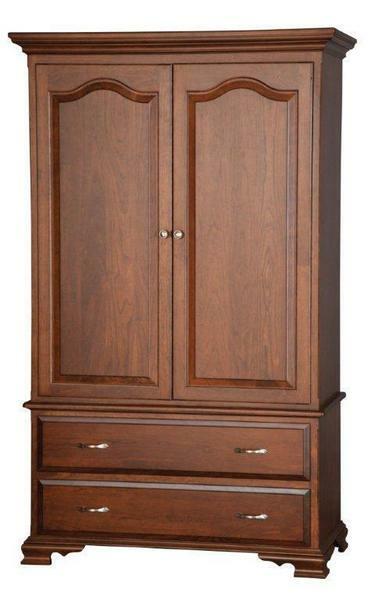 You'll be looking to spend more time in the bedroom or family room with the Amish 48" Armoire with Optional Pocket Doors adding to your home furniture collection. This beautiful armoire has it all. This lovely versatile style can be used for clothing storage in the bedroom or to house your television and movie player in a bedroom, family room or living room. Solid wood doors with beautiful raised panels open to a collection of solid wood drawers and shelving that are sure to delight you. I very happy with my new armoire. It matches my bedroom furniture almost perfectly including the drawer pulls and the scalloped molding around the base. I am so pleased with the workmanship also . Thank you very much!